In need of cooking inspiration? Look no further! Our inventive community creates fabulous recipes, and we choose the best one each week to cook, photograph, and publish for the world to taste. If you’d like your own recipe to be featured, send it to community@kitchenstories.com! As the summer’s heatwave slowly dissipates from Europe, the first golden colors are starting to tinge the vibrant green scenery, hinting at the turning of a new leaf—fall is on its way. It’s the season of sweater-weather, the return of the summer-vacationing umbrella, but first and foremost; it marks the comeback of warming, comforting dishes in simmering pots. 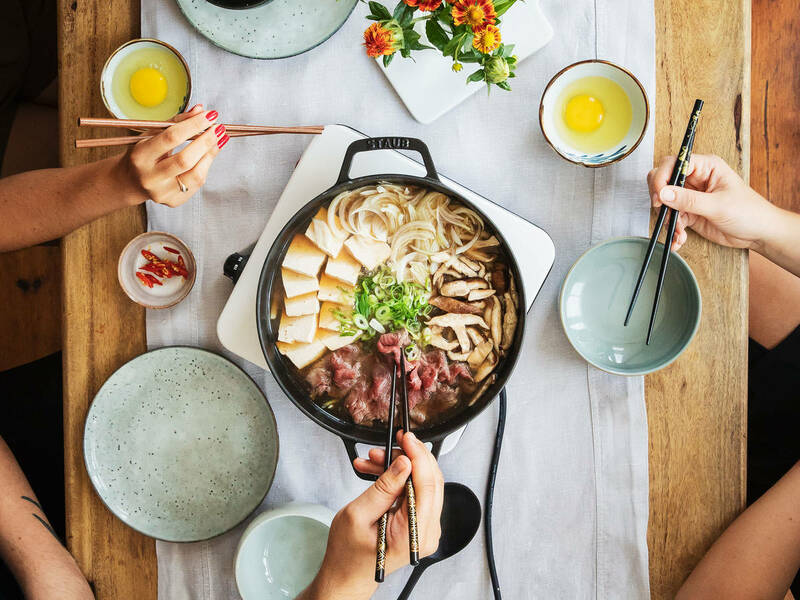 And of course, we knew we could rely on our beloved community to contribute the perfect recipe for re-adjusting to the changing weather, a Japanese-styled hot pot dish: Sukiyaki. A round of applause to community member Grant Pedersen for the recipe! Despite the mainstream popularity of Japanese food, many of us are not familiar with how to prepare our favorite restaurant orders at home. We might have recently adopted ‘umami’ into our vocabulary, but find ourselves mystified by seemingly alive bonito flakes squirming on top of a steaming bowl of ramen, and perhaps are a little intimated to know that it takes longer to become a sushi chef than a surgeon. With this in mind, we were drawn to this sukiyaki recipe that is strikingly simple, but still embodies the traditional Japanese technique, flavor, and stunning presentation. Not only is this recipe great for a quick and comforting weeknight dinner—served directly from the stove—it can also transform into a table centerpiece served as a classic hot pot that lets each person pick and choose as they please, leaving everyone satisfied. Sukiyaki is also easy to customize to any diet by subbing in different core ingredients. Sukiyaki is traditionally made with thinly sliced prime Wagyu beef, known for its intense marbling and notoriously heavy price tag. It can be found frozen, pre-sliced at your local Asian supermarket. However, most fillet steak cuts work as a budget(ish) friendly alternative. You should look for well-marbled (but not too fatty or sinewy) pieces and have your butcher slice them very thinly. Alternatively, pop it in the freezer for 1 hour and carefully slice it with a sharp knife against the grain. As you will only need approx. 100 g. of meat per serving, it is worth to splurge a few extra bucks on a high quality well-marbled piece, but in general, the rule goes, the thinner the slice the tenderer. So that you can enjoy the beef exactly how you like it, simply add the thin slices to the broth once it has been removed from the heat. You’ll be able to see the meat cook to perfection before your very eyes—serve it into bowls, or dive in with your chopsticks. Since the meat is sliced so thinly it takes not time at all for the broth to cook it. Store-bought broth is a quick and convenient option, but if you have time to put in a little extra effort, we highly recommend making your own stock from scratch. Traditionally, sukiyaki is made with a light broth, but if you’re looking for a more intense flavor, you can use beef broth or even spice up a vegetable broth with fresh ginger and garlic. Our community member, Grant Pedersen’s recipe keeps it simple with shiitake, onion, and scallions, but if you wish to add more veggies, or make your sukiyaki vegetarian, there are plenty of options out there. Leafy greens, such as watercress or thinly sliced Chinese cabbage, work well as they cook fast and add texture. Adding extra mushrooms is also a great substitute for meat, especially shiitake with their meaty-texture and earthy flavor. If you can’t get your hands on fresh ones, you can use the dried kind and pre-soak them in water for 30 min., just be sure not to pour the soaking liquid down the sink as it’s full of flavor and can be added to your soup to give it an extra umami base. Regular button mushrooms or the Japanese classic, Enoki, also works well with this dish. For the noodles, you can use fresh or frozen udon noodles or shirataki noodles for a low-carb option. Sukiyaki is also traditionally served with the obligatory staple of rice—a perfect way to soak up the flavorful broth and, perhaps for the more adventurous people out there, a dipping sauce of beaten raw egg. How would you customize your sukiyaki? Do you have another hot-pot recipe you would like to have featured on Kitchen Stories? Send your recipe to community@kitchenstories.com!